Monsoon season here is so peaceful. Today there has been constant rain all day but still light enough that one can walk around comfortably with a rain coat and umbrella. We were joking wondering when is the last time you put on a rain coat at home and just went for a walk around town while it is raining? Usually when it rains at home I never think to do this. Here we are so intrigued by the scenery that it is quite fun to get out and walk around. As we have many rainy days ahead we will continue to explore rain or shine! Yesterday was our first full day here. We figured out that it is not a good idea to leave the house without an umbrella and rain coat. The previous day we tried to walk to the beach and as soon as we got close a thick cloud of rain started to come and everyone on the beach was running the other way. We did the same. So Saturday we tried again a little better prepared. We got down to the ocean and the waves were breaking really nice. 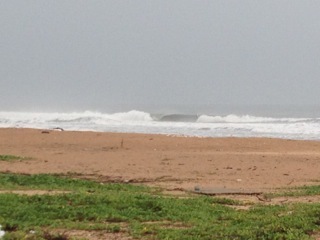 It was an offshore wind and the swell was about 4-5ft. There were only a few locals on the beach and a couple of men were fishing from the shore. We decided to travel into town and we got on the local bus and headed to Panaji which is the capital city of Goa and it means “Land that never floods.” This is a good thing because it rains pretty serious here. There are many hills along the banks of the Mandovi River lined with classic red tiled roof houses that are reminiscent of Europe. Goa’s history dates back to 20,000 – 30,000 years with rock art engravings that show some of the earliest proof of human life in India. In more recent times Goa was ruled by the Portuguese from 1510-1961. Goa exhibits an interesting blend of Indian vibrancy with European fortitude. 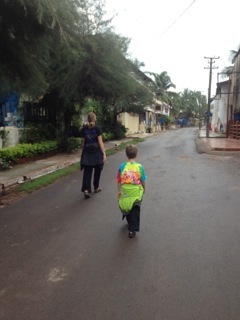 Traveling by local bus is a great way to see the culture of Goa. It is hot, sweaty, loud and colorful. The locals are friendly enough yet keep to themselves. Loud music plays to the liking of the driver ranging from Goan trance music to beautiful ballads sung in Hindi. The bus gets extremely overcrowded and it pulled over so many times and just sat still which we are still trying to figure out why. We later realized we were waiting for the possibility for more passengers! (not sure where they would fit) Traveling by bus is a great way to practice meditation. The intensity of it requires patience and the need to not focus on any one distraction too much. 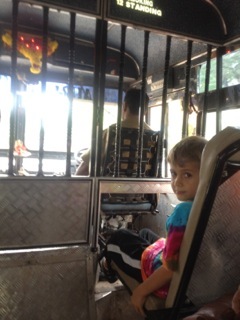 This experience is so much different from our local bus system at home…air conditioned and timely. 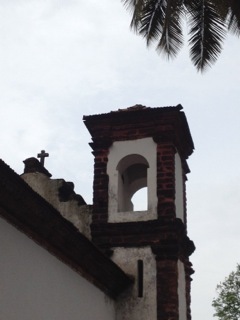 While in Old Goa we visited the Se Cathedral of Santa Catarina. 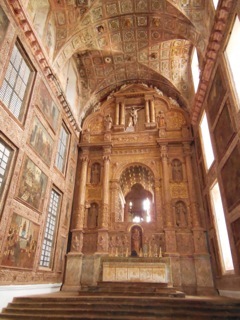 It is the largest church in India and probably the most celebrated religious buildings in Goa. It exhibits a Tuscan exterior and a Corinthian interior and reminds me so much of being in Florence. There are about 24 million Christians in India which constitutes 2.3 percent of the total population. Historically the Christians and Muslims have not practiced tolerance for other religions and culture. So with this said I wonder if all Indians were happy that the Portuguese got kicked out? Not so. The popular opinion seems to be that this region was much better off from the work the Portuguese Catholics have done here. They say the infrastructure was so much much stronger and that there was a lot less corruption then as there is now. I remember on our first trip to India I had the thought that Gandhi was a hero to all of India. Then I met some Indians that said Gandhi was not practicing for the best interest of the people. I was shocked. So once again, India turns all my misconceptions on their heads. Another reason why I love this country so much.